The "mirrorless war" has brought with it an arms race for the fastest mirrorless lenses. The Nikkor 58mm f/0.95 Noct is the showcase lens for the Nikon Z6 and Nikon Z7, but the company says that the Z-mount is capable of an eye-watering f/0.65 lens. Sony, however, says that there is no market demand for such a lens, and that anything faster than f/1.2 simply "would not make business sense". This latest bout of aperture willy waving came after French outlet Mizuwari published an interview with Nicolas Gillet, Nikon France's Director of Marketing and Communication. Gillet explained that the f/0.95 Noct was designed "to demonstrate our ability to do extreme optics, without compromise" (translation via Google), since the physical limitation of the F-mount prevented usable optics beyond f/1.4. "Moreover, for the record, we did not communicate it at all, but our engineers calculated that theoretically, on Z-mount, it was possible to make optical opening at f/0.65… but that's theory, and I'm not sure we'll see a concrete application." 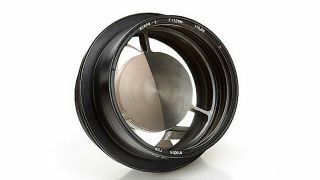 Just because it's theoretical, doesn't mean it's impossible or impractical; lenses such as the GOI Iskra-3 72mm f/0.65 mirror lens (pictured at the top of this article and below) already exist, though they are certainly the exception not the rule. Sony, for its part, believes that anything faster than an f/1.2 lens just isn't viable in the current marketplace. In an interview with Amateur Photographer, Kenji Tanaka, Senior General Manager of Sony's Digital Imaging Business group, was asked whether the company could produce an f/1.0 lens. "Yes we could, but there is no market demand. Maybe some demand exists for an f/1.2, but an f/1.0? Technically we could produce an f/1.0, but it would not make business sense." We've noted before that using f/0.95 lenses can be an exercise in futility, thanks to the razor-thin depth of field. However, in an age where megapixel bragging is becoming redundant, silly apertures may become the new holy grail.